(Bloomberg Opinion) -- The Lyft-themed pink confetti has fallen. The executives have done their best to say nothing interesting in their interviews. The first stock trades went off without a hitch. Now Lyft Inc. can settle into the next stage of its corporate life, as a richly valued company facing high expectations and a long list of business opportunities and challenges. 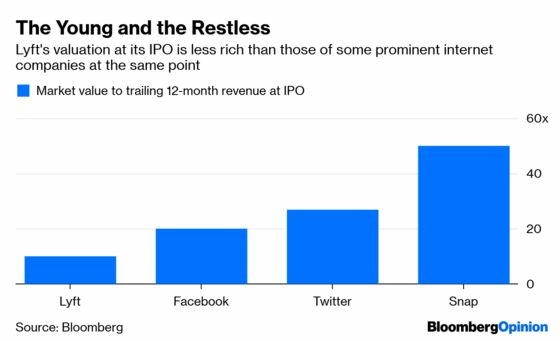 It feels unfair that a young company can prepare for years for an initial public offering and that’s just the beginning of a very long race with very high stakes. Yet here we are. This is the first day of the rest of Lyft’s life. Lyft was able to appeal to stock buyers excited to own a piece of a fast-growing company grabbing at the giant pool of consumer spending on transportation. Based on Lyft’s first rush of stock trading Friday, the company is valued at about $25 billion excluding extra shares that its bankers may sell and equity held by employees and others. That’s a higher stock market value than all but about 275 companies in the U.S. and about the same as Tyson Foods, which has 18 times Lyft’s revenue and actually, you know, turns a profit. That’s a successful first day, and Lyft should be congratulated for surviving its cutthroat early years and helping to create a novel form of transportation. What happens next is even tougher: Lyft has to last without a constant infusion of investor cash and fulfill the lofty expectations of everyone who staked money or their livelihoods on this young company. No pressure. As I’ve written before, even after more than a decade of software-enabled rides with ersatz taxi drivers, it’s still not clear this is a viable business. Yes, Lyft and its larger rival Uber Technologies Inc. did more than $58 billion worth of rides last year, and that’s impressive for a mode of transit that didn’t exist when the last U.S. president entered office. The companies and their counterparts around the world have changed people’s behavior and forced many cities to figure out how to keep up. It is the kind of disruption that most technology companies brag about but don’t really deliver. Now Lyft will have to start proving that the disruption isn’t a mirage — that demand from riders and the supply of drivers will hold up when Lyft can no longer sell rides below cost or funnel cash and other incentives to keep luring drivers. Lyft will need to navigate regulators pressuring the company to contribute more to cities’ crumbling infrastructure, and drivers who believe they’re getting a raw deal. The biggest open questions are rider demand and economics for those rides. I was surprised at the relatively small number of trips that Lyft fulfills, about 18.6 million in the fourth quarter. That’s about the same number of people who spent far more than a taxi ride to buy a smartwatch like the Apple Watch in the same period. On the flip side, if Lyft is responsible for a percentage point or two of the vehicle miles in the U.S., there’s a lot of growth potential if the company can tap that other 99 percent and give people reasons to give up their personal cars. If. It’s unclear what the true demand would be if Lyft’s fares were set to the point at which revenue per ride exceeded the company’s costs. In the fourth quarter, Lyft’s average cost per ride was $5.27, compared with the average net revenue of $3.75 a ride. Lyft’s expenses for insurance are a big reason its cost for each ride has risen even as the company grows. Once companies go public, investors can be unforgiving if those market debutantes don’t meet high expectations. Snap Inc.’s first two years as a public company have not gone well. 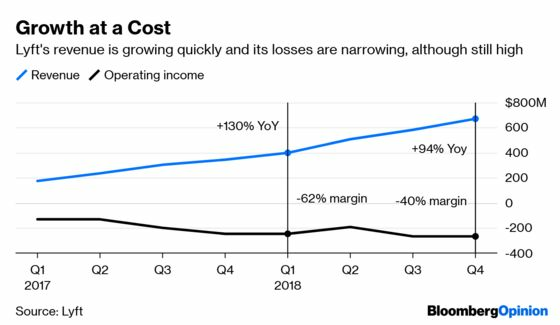 The company’s revenue increased more slowly than optimists expected, it struggled with some of its technology, and it had high turnover of key executives. Snap’s stock price has climbed this year but is 36 percent below its 2017 IPO price. Facebook Inc. also had an awful first 18 months as a public company before a business model shift took hold. Facebook’s experience shows being a public company is a long game. The hard part is over for Lyft. Now the much harder part can begin.